Photothermal radiometry and its multiplex version Lockin-thermography are being used since several years for remote non-destructive testing. They are based on propagation and reflection of thermal waves which are launched from the surface into the inspected component by absorption of modulated radiation. Phase angle images obtained by superposition of the initial thermal wave and its reflection display hidden structures down to a certain depth underneath the surface. Elastic waves sent into the component propagate inside the sample until they are converted into heat. A defect causes locally enhanced losses and consequently selective heating up. Therefore amplitude modulation of the injected elastic wave turns a defect into a thermal wave transmitter whose signal is detected at the surface by lockin-thermography synchronised to the frequency of amplitude modulation. 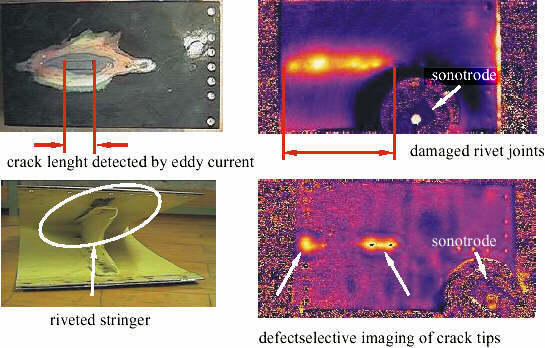 This way ultrasound lockin thermography (ULT) allows for selective defect detection which enhances the probability of defect detection in the presence of complicated intact structures. Measurements were performed on various kinds of typical defects in aerospace structures (both metal and non-metal). The obtained phase angle images reveal areas of hidden corrosion, cracks in rows of rivets, disbonds, impacts, and delaminations. In all these cases the intact structure was suppressed since it heats up much less in the elastic wave field. We present examples which are relevant e.g. for maintenance and inspection of aircraft. Thermal waves  have been used very early for remote monitoring of thermal features, e.g. cracks,delaminations , and other kinds of boundaries. After the advantage of signal phase had been discovered [3-5], phase angle imaging using photothermal techniques  became a powerful tool for imaging of hidden thermal features due to the enhanced depth range and its independence on optical  or infrared surface features. As the thermal diffusion length is the important parameter for depth range , it turned out very soon that imaging of features deep underneath the surface requires very low modulation frequencies and a correspondingly long time to obtain a photothermal image. Unfortunately many industrial questions are related to samples with defects at about a millimeter depth. An image obtained pixel after pixel at a modulation frequency in the 1 Hz range could easily require several hours. This of not of real interest for many industrial applications. One approach allowing for a reduction of inspection time is lockin thermography where the low frequency thermal wave is generated simultaneously on the whole surface of the inspected component and monitored everywhere several times per modulation cycle in order to obtain an image of amplitude and phase of temperature modulation [9-12]. In this case the inspection time is given by a few modulation cycles. As one can image square meters of airplanes within a few minutes , one has a powerful method for fast inspection of safety relevant structures with a depth range of several millimetres in polymer composites. In all these cases absorption of intensity modulated radiation generates on the whole surface a thermal wave. It propagates into the interior where it is reflected at boundaries so that it goes back to the surface where it is superposed to the initial wave (see Figure 1, left). This way a defect is revealed by the local change of phase angle. Fig 1: Principle of optical (left) and ultrasound lockin thermography (right). Therefore both defects and intact structures are imaged at the same time. Defects can be revealed only by comparing the observed features with expected features provided by theory or by a reference sample. Defect detection would be much easier if a mechanism were involved where a defect responds selectively so that the image would contain only the defect and not the confusing background of intact features. Defects differ from their surroundings by their mechanical weakness. They may cause stress concentrations,and under periodical load there may be hysteresis effects or friction in cracks and delaminations.As defects may be areas where mechanical damping is enhanced, the ultrasound is converted into heat mainly in defects [14, 15]. Modulation of the elastic wave amplitude results in periodical heat generation so that the defect is turned into a local thermal wave transmitter (see Figure 1, right). Its emission is detected via the temperature modulation at the surface which is analysed by lockin thermography tuned to the frequency of amplitude modulation . The amplitude image displays the efficiency of local mechanical losses, so it shows the imaginary part of elastic properties. Though the technique is related to ultrasonic inspection, the ultrasonic transducer is attached at a fixed spot from where the acoustic waves are launched into the whole volume where they are reflected several times until they disappear preferably in a defect and generate heat. These high frequencies are very efficient in heating since many hysteresis cycles are performed per second. Figure 2 displays the resulting experimental arrangement. The acoustic or ultrasonic transducer is attached to the component that is monitored by a lockin thermography system tuned to the low frequency of amplitude modulation. Fig 2: Experimental arrangement of lockin thermography with ultrasonic excitation. The elastic wave frequency was typically around 20 kHz while the amplitude modulation frequency was usually below 1 Hz. The acoustical energy provided by the source was in most experiments several hundred Watts. Duration of a measurement was typically 3 minutes. In the following we describe results that were obtained on various materials used for aerospace applications - metal and polymers reinforced by glass (GFRP) or carbon fibres (CFRP), and ceramic material resulting from pyrolysis of CFRP and subsequent infiltration with silicon. Fig 3: Access hole for aircraft maintenance. In a previous paper  we presented examples for detection of damage in aerospace structures (GFRP and CFRP) using lockin thermography with optical excitation. Further investigations were performed with acoustic excitation (ULT) the advantage of which becomes obvious by comparison with optical excitation (OLT). An example is the cover of an access hole for aircraft maintenance. Due to an impact (see Figure 3)there was a damage at the outer edge next to the screws. The phase image of OLT is dominated by the holes for the screws and the thermal contact of the two joint pieces of which the cover consists, while the ULT image shows mostly the defect area where boundaries are rubbing against each other. Similarly striking is the difference between OLT and ULT in impact detection: while the OLT image (Figure 4, left) displays mainly the fibre directions +/-45 deg. with no indication of the impact (the circle in the upper right corner is a sticker), the ULT image shows only the impact (bright central spot in Figure 4, right) in such an obvious way that it would certainly attract attention in the maintenance inspection. Optical lockin thermography: phase image at 0.03 Hz Ultrasound lockin thermography: phase image at 0.03 Hz, ultrasound power: 300 W Fig 5: Stringer disbonding and cracks in a Do 328 panel. Fig 4: Impact damage in CFRP plate. A more complicated structure is presented in Figure 5 where a component of 120 x 80 cm 2 size wasinspected from its flat front surface. From previous measurements it was known that the T-shaped stringers at the rear surface had partially disbonded due to the load applied under a strength test .When the component was exposed to acoustic excitation we saw the disbonded area and those parts of the stringers where disbonding had started so that relative tangential motion and normal pressure were both present and caused friction losses. Of particular interest is the spot on the upper left edge of the OLT image. As the OLT image did not show a corresponding feature it was obvious that the boundary between the stringer and the plate was not involved. At closer inspection it turned out that the vertical part of the stringer had a crack which became visible due to thermal wave propagation from this source along the stringer cross section into the plate. CFRP can be used as a starting point for another material: Heating of CFRP results in pyrolysis of the polymer matrix material. When the remaining carbon fibre skeleton is subsequently immersed into liquid silicon the resulting material is a silicon matrix containing carbon fibres and silicon carbide at the boundaries. This C/C-SiC materials is of interest for high temperature applications in brakes and in heat shields for space vehicles. The kinds of defects that need to be detected are local variations of the silicon content and delaminations. The phase angle images of OLT and ULT both obtained at 0.03 Hz (Figure 6) on the same C/C-SiC sample look much different. The OLT image responds strongly to the different content of Si in the centre (orange coloured spot) while the ULT image shows the cracks expanding from this area since they are rubbing against each other under periodical loading. This information on the two different kinds of defects could not have been extracted from only one image. Fig 6: Phase images of a C/C-SiC sample at 0.03 Hz. 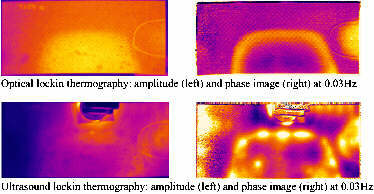 Optical lockin thermography (left) and ultrasound lockin thermography (right). Fig 7: Delamination in C/C-SiC. A delamination in C/C-SiC was imaged both with thermal wave magnitude and phase in OLT and ULT (Figure 7). The difference of magnitude and phase image in OLT is due to the different depth ranges /3-5/. The phase image of ULT responding to friction at the boundaries shows those areas of the delamination that are still in contact with each other. Not all aerospace vehicles consist of modern materials with high specific strength. Light weight metal is still being used for many aircraft, and many ageing aircraft need to be inspected whose structural strength is provided by metal. Defects to be detected and monitored are e.g. cracks, corrosion, and loose rivets. In a previous paper  we described how lockin thermography can be applied to monitor the compressive stress provided by screws or rivets. This way one can identify loose joints rapidly in a remote way. Detection of hidden corrosion between riveted metal plates is a major concern for maintenance inspection. Figure 8 shows results obtained with phase angle images of OLT and ULT. OLT displays mainly how the rivets modify the transport of modulated heat. The ULT image looks different since its contrast mechanism is the local relative motion of the two aluminium plates under load. Fig 8: Riveted aluminium stringer. Fig 9: Crack along a row of rivets. The detection of a crack along a row of rivets is shown in Figure 9 where we used a modulation frequency of 0.5 Hz to reduce the thermal diffusion length which determines both depth range and resolution . The crack had been known from eddy current inspection (top left). With ULT a bright area was found with a significantly larger extension (top right). After all rivets were removed (see component at lower left) a phase image was taken again with ULT. As there was no more any rubbing contact to the rivets or the rib, only the tip of the crack caused losses whose locations (lower right) are identical with the ends of the original bright structure (top right). So it has been confirmed that the size of the original structure was the true crack length. This example shows how efficiently ULT can be applied for the selective imaging of fatigue cracks. The examples show that acoustically generated thermal waves are applicable for non-destructive inspection of aerospace structures where one can detect impact, delamination, cracks, and hidden corrosion. Applications for inspection of smart structures (which are of significant interest in the same field) are described in another paper of this conference . The advantage of selective defect heating is obvious: besides highlighting of defects the energy is used in a very efficient way since it is not wasted for heating of uninteresting intact areas. This makes ULT well suited for non-destructive testing in the quality control of safety relevant structures, e.g. in aerospace applications.The problem that still needs to be solved is the injection of high power ultrasound. While optical excitation of thermal waves allows for inspection of several square meters, we are presently limited to areas of about 1 square meter with acoustic generation of thermal waves. The authors are grateful to DLR, Stuttgart for co-operation and providing samples. We also would like to thank Dornier, Manching and Luftwaffenwerft 13, Erding for providing aircraft structures. Busse G.: Optoacoustic phase angle measurement for probing a metal. In: Appl. Phys. Lett. Vol. 35 (1979) pp. 759-760. Thomas R. L.; Pouch J. J.; Wong Y. H.; Favro L. D.; Kuo P. K.; Rosencwaig A.: Subsurface flaw detection in metals by photoacoustic microscopy. In: J. Appl. Phys. Vol. 51 (1980): pp. 1152-1156. Lehto A.; Jaarinen J.; Tiusanen T.; Jokinen M.; Luukkala M.: Amplitude and phase in thermal wave imaging. In: Electr. Lett. Vol. 17 (1981): pp. 364-365. Nordal, P.-E.; Kanstad S.O. : Photothermal radiometry. In: Physica Scripta Vol. 20 (1979): pp. 659-662. Rosencwaig A.; Busse G.: High resolution photoacoustic thermal wave microscopy. In: Appl. Phys. Lett. Vol. 36 (1980): pp. 725-727. Kuo, P.K. ; Feng Z. J.; Ahmed T.; Favro L. D.; Thomas R. L.; Hartikainen J.: Parallel thermal wave imaging using a vector lock-in video technique. In: Photoacoustic and Photothermal Phenomena, ed. P. Hess and J. Pelzl. Heidelberg: Springer-Verlag. (1987) pp. 415-418. Busse, G., Wu D. and Karpen W.: Thermal wave imaging with phase sensitive modulated thermography. In: J. Appl. Phys. Vol. 71 (1992): pp. 3962-3965. Zweschper Th. 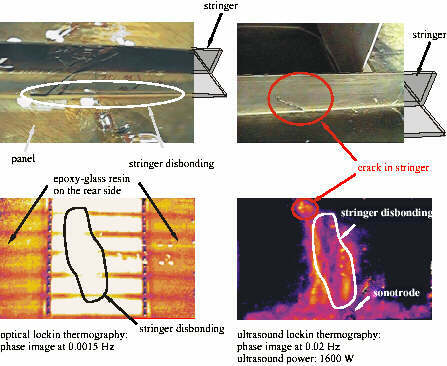 ; Wu D.; Busse G.: Detection of loose rivets in aeroplane components using lockin thermography. In: Quantitative infrared thermography, QIRT 98, Eurotherm Series 60, D. Balageas, G. Busse, and G. M. Carlomagno (Eds. ), pp. 161-166, 1998. Krohn N.; Dillenz A.; Stoessel R.; Busse G.: Selective damage detection of shape adaptive structures. This conference.